Imagine a spring day or a summer evening: the sea in front of you, the breeze that carries with it the smell of salt, the lights that illuminate the coast at sunset and the waves that break on the shoreline. Wouldn’t you like to live your wedding day in such a setting? If you love the sea, a wedding on the beach or in a seaside resort is simply a dream. Did you know that Tuscany has so much to offer also for this kind of wedding? Its contours along the Mediterranean in fact never cease to amaze. Starting from Versilia, passing through the Etruscan coast to arrive in Maremma, there are many locations overlooking the sea where you can live the day of your wedding. As we all know, Tuscany is renowned for its splendid cities of art, for its countryside with postcard landscapes, for its typical cuisine, its wine, and for the unique atmosphere that you can breathe in this region throughout the year. Something unobtainable elsewhere. But if you are in love with the sea, even in this case this region will not disappoint you. Of course, a wedding on the beach or ona cliff by the sea is a special event, which requires several precautions. First of all, you must bear in mind that most of the ceremonies that take place at the seaside or even right on the beach are symbolic: in Italy it is not possible, except in some exceptional cases, to carry out a civil ceremony, let alone Catholic, outside municipalities, churches or other environments specifically designed for this purpose. In this sense, you could choose the beach for anexchange of promises, or to do the RitualOf The Sand, or even to renew the marriage vows and promise eternal love again, this time in a completely new setting. If you want a real wedding by the sea, you could opt for a religious ceremony in one of the many beautiful churches that are located in the locations along the coast. Some examples? That of Badia di San Pietro in Camaiore, in Versilia, or the church of the Immaculate Conception in Castiglioncello, or even the cathedral of Livorno, in the heart of the city. Once you are a husband and wife you can choose a villa overlooking the sea or directly a beach establishment for the reception with all your guests. If you want to organize a civil ceremony instead, you could go to one of the municipalities along the Tuscan coast, to inform yourself about the locations made available for this type of ritual. A very popular place because it is really fascinating and a short walk fromthe sea, for example, is the Castle Pasquini of Castglioncello: a historical building in medieval style dating back to the end of 1800, where you can perform the civil ceremony. The castle also has beautiful gardens, and if you want to move to the coast for photos or for the reception the sea is very close. The town of Castiglioncello is particularly suitable for those who want a romantic location, overlooking the sea and the cliffs. Here the landscapes are truly breath-taking, and on clear days you can even see some islands of the Tuscan Archipelago on the horizon. 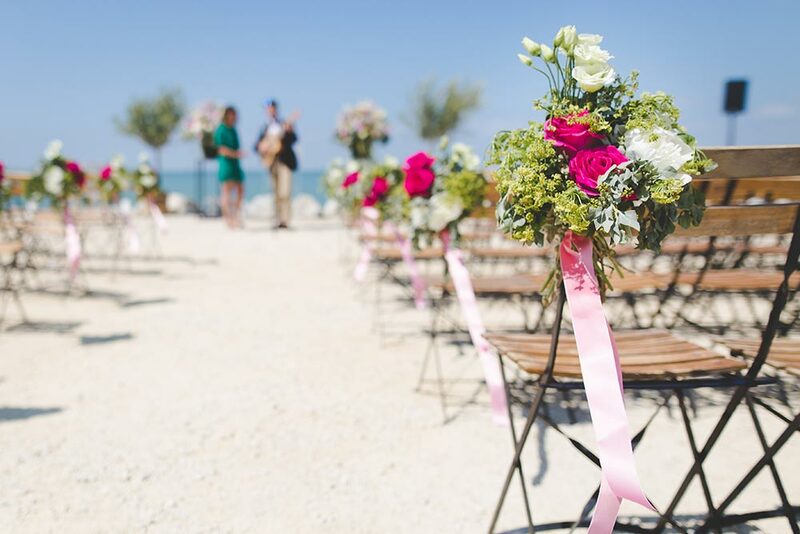 For those who dream of a wedding barefoot on the sand, in addition to the symbolic ceremony, you can perform the civil ceremony on a beach on the coast of Pisa. Other really beautiful seaside resorts, always in Tuscany, are Punta Ala, near Castiglione della Pescaia, in the province of Grosseto, theArgentario, a promontory with really magnificent beaches, and why not also theIsland of Elba or the Island of Giglio, easily accessible by ferry from the port of Livorno or Piombino. The beaches of Follonica and San Vincenzo are also very beautiful, while if you are looking for a trendy location, perhaps with a hint of luxury and also an attractive nightlife, including clubs, pubs and streets full of shops, you could opt for Viareggio, Forte dei Marmi or Pietrasanta, in Versilia. As we mentioned, to organize a wedding on the beach or by the sea you need a lot of attention to detail, because it is certainly a less usual location than many others. In addition to choosing the type of ritual you want, civil, religious or symbolic, and consequently to select the most suitable location, you must also pay attention to the time of year that you choose to celebrate your wedding. Obviously, for a day at the beach, the right seasons are late spring or summer, but keep in mind that from June to August the beaches and seaside resorts in Italy are very crowded, and therefore it is difficult to carry out the ceremony prior to the late evening. But of course, a wedding by the sea at sunset has perhaps even more charm! Alternatively, you could opt for the months of May or September, where usually the temperatures are still pleasant and the sea is certainly less crowded than in the summer months. Before concluding there is one last thing not to be forgotten: any time of the year you have chosen for the day of your wedding, unfortunately it is never possible to be completely sure of the weather conditions. The rain or the wind in this case are unpleasant options, of which a good wedding planner must take into account. For this reason, it will be important to choose a structure, especially for the reception, that can offer you a “plan B” in case of bad weather, and therefore adequate space inside or gazebos to accommodate you and all your guests withoutinconvenience. So, what do you say, are you ready for your wedding on the beach? The Tuscan sea, with its deep blue, its waves and its magnificent beaches, is already waiting for you.